The Mitfords are quite a household name (if your household is interested in history, at least) and with each sister a separate study of unique character traits and life choices, it is not surprising to find that individual biographies and studies have been produced, as well as in depth stories of the whole clan. 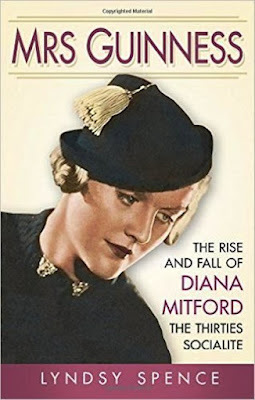 In Lyndsy Spence's book, Mrs Guinness, Diana Mitford is put in the spotlight, focussing particularly on her period as the wife of Bryan Guinness and the queen of the British social scene. Starting from Diana's birth (everyone had wanted a boy) to her unusual childhood under the control of slightly odd parents; her development as a pretty teenager with artistic tendencies, to her early marriage to Bryan Guinness - a move which was both honest and calculating - the book covered a broad narrative. Spence's writing style is witty and interesting, but also had the power to gloss over certain events and details very quickly, which sometimes made certain parts feel rushed. This reader found towards the end of the book that she had entirely missed the birth of one of Diana's children and so found herself several pages later questioning where this new baby had come from. The book is focussed on Diana's rise and fall as a 30s socialite, taking us through her marriage to Bryan Guinness and onto her obsession with Oswald Mosley. However, we do carry on into her life with Mosley, including her time in Germany and her incarceration with him by the British Government during the Second World War. The interest of Diana and her sister Unity in Adolf Hitler and the Nazi Party is an interesting focal point for a certain section of the book. In this, Spence endeavours to paint a picture for us which demonstrates a contemporary understanding of the allure of the Third Reich, without feeling the need to consider these ideas from a 21st century, more reflective point of view. In light of the inherent - and not all unspoken - prejudices which the Mitford sisters held, Diana's friendship with both Jewish and homosexual friends paints her in a comparatively positive light. However, Spence is not afraid to admire Diana whilst being clear about her least pleasing character traits - her ability to be cold-hearted, selfish and unforgiving. Whilst this lends our narrative an honesty and clarity which is refreshing - clearly several of the Mitfords, whilst being very clever souls, were not someone you would want to welcome into your intimate circle - it made it difficult for this reader to feel any sympathy for Diana. For anyone seeking a window into the lives of the Mitford sisters, this book is an interesting diversion. Amid the other works available, this reader would suggest that the book is broader in it's narrative that it first suggests; but it is nonetheless an interesting read for those keen to know more about these unusual siblings and their lives.